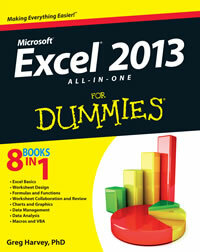 Harvey G. Excel 2013 All-in-One For Dummies. –Hoboken, New Jersey: John Wiley & Sons, 2013. –795 с. ISBN 978-1-118-51010-0. Excel 2013 relies primarily on the onscreen element called the Ribbon, which is the means by which you select the vast majority of Excel commands. In addition, Excel 2013 sports a single toolbar (the Quick Access toolbar), some context-sensitive buttons and command bars in the form of the Quick Analysis tool and mini-bar, along with a number of task panes (such as Clipboard, Research, Thesaurus, and Selection to name a few). Among the features supported when selecting certain style and formatting commands is the Live Preview, which shows you how your actual worksheet data will appear in a particular font, table formatting, and so on before you actually apply it. Excel also supports an honest-to-goodness Page Layout view that displays rulers and margins along with headers and footers for every worksheet. Page Layout view has a zoom slider at the bottom of the screen that enables you to zoom in and out on the spreadsheet data instantly. The Backstage view attached to the File tab on the Excel Ribbon enables you to get at-a-glance information about your spreadsheet files as well as save, share, preview, and print them. Last but not least, Excel 2013 is full of pop-up galleries that make spreadsheet formatting and charting a real breeze, especially with the program's Live Preview. If you've been using earlier versions of Excel (especially Excel 2007 or Excel 2010), the first thing you notice about the Excel 2013 user interface is its rather flat (as though you've gone from 3-D to 2-D) and decidedly less colorful display. Gone entirely are the contoured command buttons and color-filled Ribbon and pull-down menu graphics along with any hint of the gradients and shading so prevalent in the earlier versions. The Excel 2013 screen is so stark that even its worksheet column and row borders lack any color, and the shading is reserved for only the columns and rows that are currently selected in the worksheet itself. This new look and feel for Excel 2013 (indeed, all the Office 2013 apps) is all part of the Windows 8 user experience. This latest version of the Windows operating system was developed primarily with tablets and smartphones in mind, devices where touch often is the means of selecting and manipulating screen objects. With an eye toward making this touch experience as satisfying as possible, Microsoft redesigned the interface of both its new operating system and Office 2013 application programs: It attempted to reduce the graphical complexity of many screen elements as well as make them as responsive as possible on touchscreen devices. The result is a snappy Excel 2013, regardless of what kind of hardware you run it on. And the new, somewhat plainer and definitely flatter look, while adding to Excel 2013's robustness on any device, takes nothing away from the program's functionality. The greatest thing about the new look of Office 2013 is that each of its application programs features a different predominant color. Excel 2013 features a green color long associated with the program. Green appears throughout the program's colored screen elements, including the Excel program and file icon, the status bar, the outline of the cell pointer, the shading of highlighted and selected Ribbon tabs, and menu items. This is in stark contrast to the last few versions of Excel where the screen elements were all predominately blue, the color traditionally associated with Microsoft Word. When you first launch Excel 2013, the program opens up an Excel Start screen similar to the one shown in Figure 1-1. This screen is divided into two panes. The left pane lists recently opened workbooks and contains an Open Other Workbooks link. The right pane contains a Search Online Templates text box with links to common searches (Budget, Invoice, Calendars, and so on) followed by your user account name, e-mail, and photo, if you use one. Below you see thumbnails of various different templates that you can use in opening a new Excel workbook file. The first template thumbnail displayed here is called Blank Workbook, and you select this thumbnail to start a new spreadsheet of your own design. The second thumbnail is called Take a Tour, and you select this thumbnail to open a workbook with five worksheets that enable you to play around with several of the nifty new features in Excel 2013. I encourage you to take the time to open the Take a Tour template and play with its worksheets. When you click this thumbnail, Excel opens a new Welcome to Excel workbook where you can experiment with using the new Flash Fill feature to fill in a series of data entries; the Quick Analysis tool to preview the formatting, charts, totals, pivot tables, and sparklines you can add to a table of data; and the Recommended Charts command to create a new chart, all with a minimum of effort. After you're clone playing with these features, you can close the workbook by choosing File; Close or pressing Ctrl+W and then clicking the Don't Save button in the alert dialog box that asks you whether you want to save your changes.